They say smell is the sense most closely tied to memory. If I could make your screen scratch-n-sniff, I would, and you’d be instantly transported back to the Middle Kingdom. Which was your favorite? What would you add to this list? Sign up to get the latest Small Town Laowai sent right to you. One of my new “favorites” is the downstairs neighbor that burns something daily or more that smells like pot. It might be called Chinese medicine here . . .
Is stinky tofu in that list? A majority of those “aromas” could be attributed to Thailand as well. At least Chiang Mai, where we lived. Makes me homesick, interestingly enough. I mean, some of those smells were really rank! It really goes with the construction smells one, but it’s a really strong, almost sweet, headache-inducing adhesive smell that I don’t think I ever smelled before coming here. Also there’s an adhesive that’s used in tape and children’s bubbles here that is apparently banned in other countries. But I’m sure you’ve smelled the bubbles and know what I’m talking about. And the agony of smelling amazing food cooking at a restaurant but having no idea what it is or how to get some yourself. It kind of goes with the neighbor cooking smells that come through my stove vent and make me want to go knocking on doors to hire the person to cook for me. Unless it’s the choking chili smell coming through the vent. Oh, and apartment bathroom drains! And the smell of air pollution! And jasmine bushes in bloom! I know those adhesive smells all too well. You have good scents coming through the kitchen exhaust? Lucky! No matter where we lived, we almost always had really awful smells from the neighbors cooking, like they were using sewer oil to fry fish that was on the verge of going bad. The bathroom drains. UGH. How did I leave that off the list? These are all good additions, April! Yes…bathroom drains! 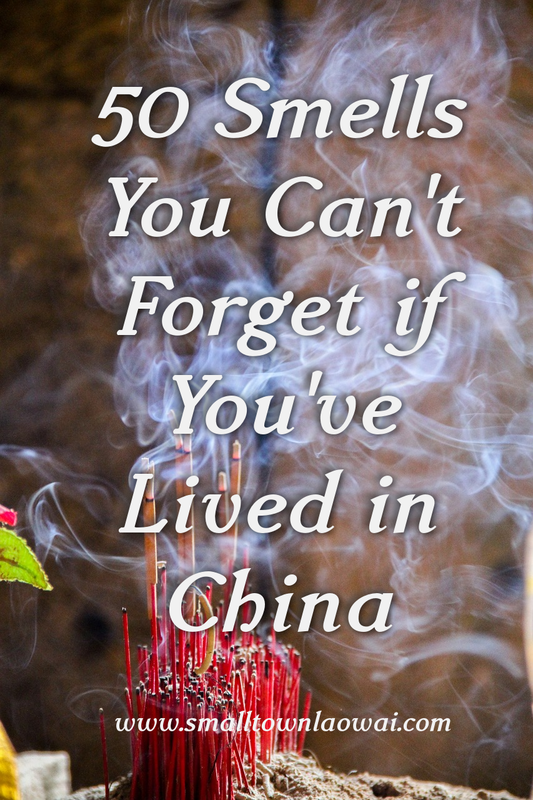 I was missing China this week…that thought…and your list and I’m not any more!! Ah yes – the neighbor’s cooking odors. We knew we have acclimated to life in Thailand when we woke up to the smell of frying garlic next door and it made us hungry. Number 46 definitely! The mopped staircase smell! Urgh! Oh, and I didn’t see.. Outrageously strong smell of garlic comibgbup from downstairs neighbour neatly every evening! Just read the other comments…cooking smells…that’s the everyday non escapable part of living in China! Loved your list! Nailed it! I LOVE garlic, but it’s different when it’s not your own cooking that is making your apartment smell like garlic. When we’re in the States I love going into an Asian market. The smells make me homesick. I’m cracking up about cigarette smoke giving your child fond memories. So true! The smells you listed are good additions.